Cover: Concept - Regurgitator, Design and Artwork - Rockin' Doodles. This EP saw a release in the USA, with a few differences to the artwork. The front cover had 'Parental Advisory' printed on it, and the back cover, in addition to the Reprise information, was missing the 'Best Before' date printed on the Australian release (which was the Australian release date). The CD Label also had a Silver Life Jacket, instead of the Yellow/Red one printed on Australian copies, and the songs are creditted to EMI Publising, rather than Control. 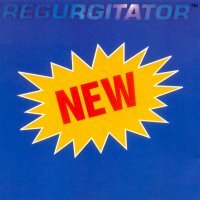 Prior to its release in the USA, two different promotional copies were issued, one with a sticker on the Jewel Case mentioning the U.S. release date of Tu-Plang (and stating that New is Regurgitator's 'Debut' EP). The other was stamped in Gold on the cover with the text: 'Promotional Use Only. Sale or other transfer is prohibited. Must be returned on demand of recording company'.